The final piece of DLC for the final Dark Souls game as we know them has been unveiled, as has its release date. Come March 28, you’ll be able to journey to The Ringed City in search of the Dark Soul itself in the last DLC for Dark Souls III. The original Dark Souls made our list of the best RPGs on PC, but Dark Souls III is great too – I argued for it as GOTY 2016. 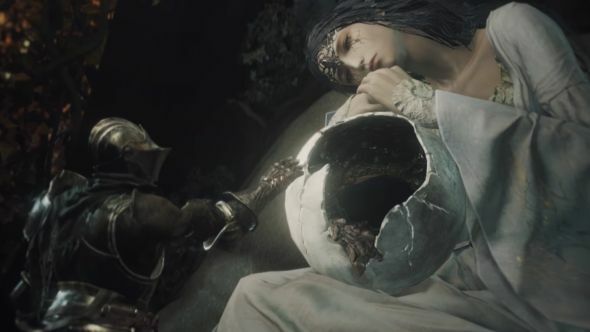 Hidetaka Miyazaki, director of devs FromSoftware, has said a lot of things about Dark Souls III – it’s the last game in the series he’ll direct but not necessarily the last ever, except actually he might like to revisit it before he retires – but at the very least, the third game marks “a turning point” for the franchise, and it’ll probably be the last we see of it for a while. That means this second and final DLC is the last piece of content we’ll see for a while, and if FromSoftware’s announcement is anything to go by, it seems we can look forward to quite a few loose ends getting tied off. Or, at least addressed; given prior form it seems silly to hope for too much in the way of resolution from this series. In the final DLC, entitled The Ringed City, players will chase slave knight Gael to the end of the world as he searches after the Dark Soul of Humanity. If you played Dark Souls III’s last DLC, you’ll remember this dude – he’s the creepy guy who drew you into the painted world of Ariandel. You’ll follow him “into the madness of the earth” and uncover “the secrets of the past”, picking up new weapons, armour and magic along the way. FromSoftware also promise “a new cast of characters teetering on the edge of insanity” and “a long-lost city filled with new horrors”. Lovely. If we’re going after the Dark Soul, this may mean we learn what became of the fourth primordial Lord who claimed it. We could tell you its name, but we’ve forgotten – it’s so easily done. Dark Souls III: The Ringed City is out on March 28.